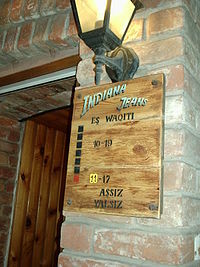 The Tatar language (Tatar tele, Tatarça, Татар теле, Татарча) is a Turkic language spoken by the Tatars. Tatar is spoken in Russia (about 5.3 million people), Central Asia, Ukraine , Poland , China , Finland and Turkey . Tatar is also native for 400,000 Bashkirs, especially those living in Ufa , and some thousands of Maris. Mordva's Qaratay group also speak Tatar. 94% of ethnic Tatar claimed knowledge of Tatar language during the 2002 census. Tatar is the official language of the Republic of Tatarstan. The official script of Tatar language is based on the Cyrillic alphabet with some additional letters not used in Slavic languages. Sometimes other scripts are used, mostly Latin and Arabic. All official sources in Tatarstan use Cyrillic at their web-sites and publishing. 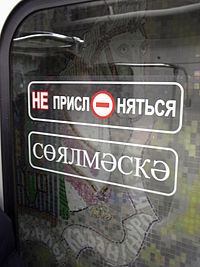 In other cases, where Tatar has no official status, the use of a specific alphabet depends on the preference of the author. Guides in Tatarstan are published in two alphabets. The Tatar language was made a de facto official language in Russia in 1917 (for the first time since 1552, when the Kazan Khanate was annexed by Russia), but only in the Tatar–Bashkir Soviet Socialist Republic. Tatar is also considered the official language in Idel-Ural State. One should note, however, that Bolshevist Russia did not recognize official languages as such; however, there were a number of languages that could be used in trial in some republics. In the Soviet era, Tatar was such a language in Bashkortostan, Mari El and other regions of the Russian SFSR. According to some, Tatar is no longer an endangered language, although it is still a low prestige language. Higher education in Tatar can only be found in Tatarstan, and is restricted to the humanities. In other regions Tatar is primarily a spoken language and the number of speakers as well as their proficiency tends to decrease. Tatar is popular as a written language only in Tatar-speaking areas where schools with Tatar language lessons are situated. On the other hand, Tatar is the only language in use in rural districts of Tatarstan. There are 3 main dialects of Tatar: Western (Mişär or Mishar), Middle (Qazan), and Eastern (Siberian). All of these dialects also have subdivisions. This is the dialect spoken by the Tatar minority of Finland. In the Minzälä subdialect of the Middle Dialect z is pronounced , as opposed to other dialects where it is silent. In bilingual cities people often pronounce x instead of h, k instead of q, g instead of ğ , v instead of w. This could be viewed as an influence of the Russian language. Another theory is that these cities were places where both the western and middle dialects were used. The influence of Russian is significant. Russian words and phrases are used with Tatar grammar or Russian grammar in Tatar texts. Some Russian verbs are taken entirely, un-nativized, and followed with itärgä. Some English words and phrases are also used. There was a distinct cryptolect, the Gäp, spoken predominantly in Kazan , but now it is extinct or near extinction. Siberian Tatars pronounce [ts] instead of ç, [j] instead of c and sometimes [p] and [t] instead of b and d. There are also grammatical differences within the dialect, scattered across Siberia. Historically, the Turkic high vowels have become the Tatar reduced series, whereas the Turkic mid vowels have replaced them. Thus Kazakh til 'language' and kün 'day' correspond to Tatar tel and kön, while Kazakh men 'I', kol 'hand', and kök 'sky' are in Tatar min, kul, kük. Tatar has 16 vowel symbols representing a variable number of sounds. Tatar exhibits vowel harmony, with some of the vowels considered front and others back. The usage of í, â, á, ó, ú, é is not universal, and sometimes ıy, a, ya, yo, yu and e are used instead. Some of them are found only in Slavic loanwords, such as é, ó, long o, long ı. Acute in á, ó, ú denotes palatalisation, but sometimes a palatalisated consonant is marked by following y before the vowel. This is only a problem for Russian loanwords. The commonly pronounced 10 vowels are native Tatar vowels: a–ä, u–ü, í–i, o–ö, ı–e. The last two pairs are considered to be short vowels. They also could mean a long vowels, but only in loanwords. and are not considered to be independent vowels. Loaned vowels are considered to be back vowels. ñ has two allophones—/ŋ/ in front-vowel words and /ɴ/ in back-vowel words. Most of these phonemes are common to or have equivalents in all Turkic languages. The post-velar consonants are allophones of the velars before back vowels. The phonemes , , and are only found in loanwords in Literary Tatar. is also of foreign origin, but is also found in native words, e.g. yafraq "leaf". While the consonants , and are not native to Tatar, they are well established. However, Tatars usually substitute fricatives for affricates, for example for , or for , and for . Nevertheless, literary traditions recommend the pronunciation of affricates in loanwords. (hamza) is a sound found in Arabic loanwords and Islamic prayer. It is usually   in loanwords. Palatalisation is not common in Tatar. As a result, speakers have no problem using the Arabic and Jaŋalif scripts, neither of which has an accepted method for indicating palatisation. In general, Russian words with palatalisation have entered into the speech of bilingual Tatars since the 1930s. When writing in the Cyrillic alphabet Russian words were spelled as they are in Russian. In today's Latin orthography, palatalisation is sometimes represented by an acute diacritic under the vowel. Some Tatars speak Russian without palatalisation, which is known as a Tatar accent. Stress is on the final syllable. Tatar phonotactics dictate many pronunciation changes. In consonant clusters longer than two phones, ı or e (whichever is dictated by vowel harmony) is inserted into speech as an epenthetic vowel. Like other Turkic languages, Tatar is an agglutinative language. Tatar has been written in a number of different alphabets. Writing was adopted from the Bolgar language, which used the Orkhon script, before the 920s. Later, the Arabic alphabet was also used, as well as the Latin and Cyrillic alphabets. Before 1928 Tatar was written with a variant of the Arabic alphabet (Iske imla ...- 1920; Yanga imla 1920-1928). In the Soviet Union Tatar was written with a Latin orthography called Jaŋalif. In Tatarstan (a republic of Russia where Tatar is most commonly used) and all other parts of Russia a Cyrillic alphabet is used to write Tatar; also in Kazakhstan . A Latin alphabet-based system has been used mostly in Tatarstan since 2000 and generally on the Internet, although this has been less common more recently due to the Russian law that all official languages of Russia must be written in Cyrillic. Tatar's ancestors are the extinct Bolgar and Kipchak languages. Crimean Tatar is not closely related. The literary Tatar language is based on Tatar's Middle dialect and the Old Tatar language (İske Tatar Tele). Both are members of the Kypchak group of Turkic languages, although they are also partly derived from the ancient Volga Bolgar language. The Tatar language strongly influenced most of the Finno-Ugric languages in the Volga River area.